Shelby Eisenberg had just 10 seconds to let go of the gray tube bobbing off the coast of Grand Cayman and plunge into the depths of the Caribbean. Just 10 seconds to begin her attempt to go deeper than any American woman had ever dove while using only the oxygen in her lungs. Her window was closing, creating more pressure on her than she would feel at her target depth of 85 meters, under 22,400 gallons of water. Yet to go that far, it was imperative she remain calm. Eisenberg put her hands up, then she dove down, a graceful mermaid leveraging her monofin through the clear, cobalt water. When she reached her target depth, she snatched a tag off a weight tethered to a rope, then sped her way back to the surface. As she emerged into the glorious, oxygen-rich air, the smile on her face said it all. She had just set the national record for a controlled weight freedive, ending a six-year-plus monopoly on the mark held by Ashley Futral Chapman of North Carolina. Chapman held the record at various depths before setting her personal best, 84 meters, in September 2016. After breaching the surface, Eisenberg still had to wait another 30 seconds to go through a brief series of tests and have the judges confirm her record, but she wasn’t worried. She stayed calm. The same couldn’t be said for the judges and safety personnel who witnessed the feat Sunday at the Deja Blue International Diving Festival. They circled around her and broke into whoops and splashes once the judges flashed the white cards that signaled the dive was legitimate. Francesca Koe of San Francisco, who is well-acquainted with Eisenberg because of their Bay Area connection, was among the three judges in the water that day. The record-setting dive came as a surprise to many. Eisenberg, who goes by the nickname “Shell,” has only been freediving for six years and competing for four. A former Westside resident — her parents Sandy and Geoff still live there — she attended the University of Hawaii after graduating from Kirby School in 2009. 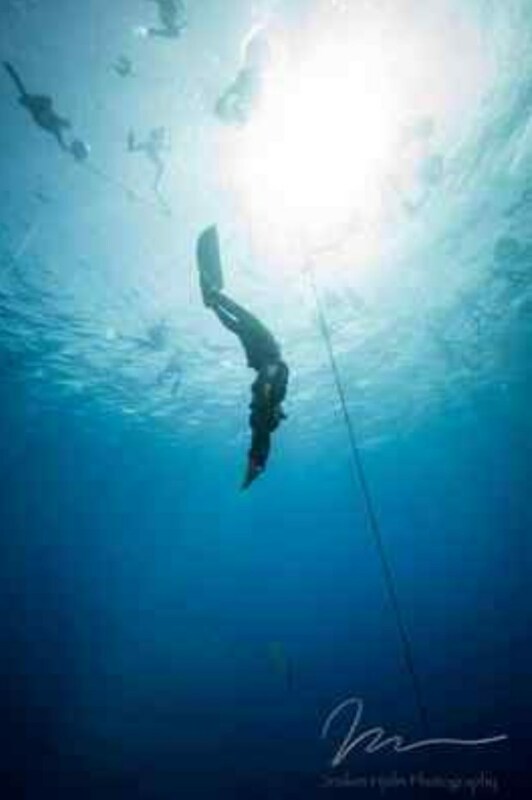 There she began experimenting with freediving as a way to get a better look at reef and sealife. In 2012, she took her first freediving course (similar to SCUBA diving, participants must be certified) and she entered her first competition in 2014. Last year Eisenberg became a professional freediving instructor for Performance Freediving International, a company that trains and certifies people in the sport, including the cast of the upcoming “Avatar” sequel. “It’s something that’s always been really difficult for me to describe and put words to,” Eisenberg said of the freediving experience. “You’re deep in the ocean, deep in nature. Even though there are a lot of people on the dive, there’s a feeling that it’s just you in the water, and it seems to get clearer as I go deeper. Though she had previously set two records for pool diving, which is measured by length, her personal-best ocean depth before arriving in the Grand Cayman last week was 74 meters, which many believed did not put her in striking distance of Chapman’s mark. Over the course of the weeklong competition, she drew closer and closer. Then, in her last dive before setting the record, she missed an attempt. Knowing she had just one more dive before returning to her home in Hawaii, however, Eisenberg decided to go for the gusto. “Shel’s 85-meter dive was incredible on so many levels,” John Hullverson, president of USA Freediving, said in a statement. “Not only was she able to withstand the nine atmospheres of pressure her body was under at that depth, but for her to endure the hypoxia, increased lactic acid buildup in her muscles and urge to breathe throughout the nearly three-minute dive — and then complete her surface protocol so cleanly — is a testament to what kind of shape she’s in. Eisenberg doesn’t think so either. She’d like to tack on another meter or two this year alone. But she has no intention of plateauing there. While 104 meters is the women’s constant-weight world record, only a couple of U.S. men have reached 100 meters, and no U.S. women. Eisenberg would like to be the first, but she said she wouldn’t mind if someone else beat her to it. Her motto now is the same as it was when time was running out on her record attempt: Take a breath, then take the plunge.